coming back to work after 10 days off… it’s kinda nice to see everyone again. we’ll see how i feel in a couple days. i got to take the first shower in my new bathroom on thursday. it was the awesomest. my week-long vacation is slowly coming to an end. tomorrow is the last day of it. at least the first half was almost too hot. these last couple days have been very cold and rainy and refuses to give up. i brought the budding plants in from the cold. hopefully they don’t mind the stink of disinfectant all over. kurt and i power-cleaned the house today to get rid of all evidence of construction. and dog hair. at least for half a week. every time we clean, we say, “we should do this every week!” and then we don’t. shh, i think it’s the first time the kitchen floor had been mopped since we moved in. don’t tell anyone. What does usable water mean? it’s not drinkable. but it is, in fact usable. actually, plants hate tap water. it’s undistilled. rainwater, on the otherhand, gets distilled up in the sky with all the crap that happens up there. i forgot to take a picture of the finished product. it’s in the shed now and it’s pouring out, so you’ll just have to wait. 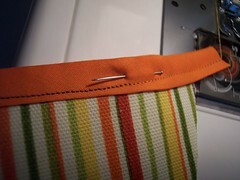 i just threaded my first bobbin, and sewed my first significant project. 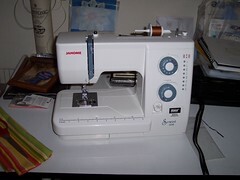 tomorrow morning, i’m headed to hans’ sewing center to pick up a brand new janome sewist 509 sewing machine. i starter a project today that took 1 hour to hand-sew a foot. and i have several more to go. i figure it’s a good investment for at least the upkeep up articles of clothing, if not for making new stuff for the house. i even found myself keeping the 24″x5″ scrap of fabric today, just in case. now i need to clear off the drafting table for projects. on this earth day, as first home-owners, we installed a rain barrel; and collected almost 2 usable gallons of water (the spout sits 4″ from the bottom). i also just ordered a scalewatcher from a company in california. it’ll reduce scale in our water system, presumably without need of a water softener. i’ll certainly be keeping track of that one. i also just finished filling our garden with 21 cubic yards of compost that smelled like the south end of a northbound cow. i, really, have been going non-stop since friday and will probably be happy to go back to work for relief. 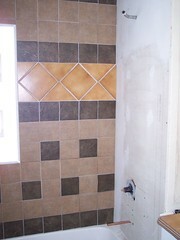 the grout may be going in this afternoon; tomorrow morning at the latest. mom and george met me at marigold for breakfast (where i got to see longtime friend who is now the general manager!) then around the square once for the first farmer’s market of the season. i walked away with some rootable pussywillows and a baby cherry tomato plant. then the work began. 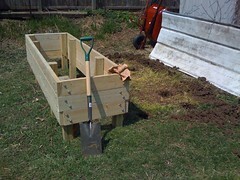 the raised-bed garden you see above took 4.5 hours from unloading the wood to putting in the last bolt. today, i dug post holes and put a coat of sealer on the untreated wood. i think i’ll wait until tomorrow to do the second coat. the bathroom isn’t going as fast as i’d like, but it looks like they’ll be done with tile and grout tomorrow, if we’re lucky. we had a minor snafu with the fixtures we bought… see, they weren’t moen brand, so it was either rip out half the wall and re-plumb for the new brand, or go get another moen fixture. we opted to get another moen fixture. kurt’s understandably disappointed, but i don’t think the shape of the faucet is worth tearing out what they’ve done. update: apparently the first set of fixtures will work better, so kurt went back to menards to return the moen and to home depot to get the first one.